An investigator. A criminal. A woman. A complex plot. A city. Who doesn’t love a noir classic. You’ve heard of fractured fairy tales. 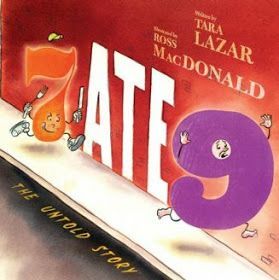 7 Ate 9: The Untold Story, a picture book written by Tara Lazar and illustrated by Ross MacDonald, is a fractured punchline. A layered “true story” based on the well-known children’s joke, “Why is 6 afraid of 7?” The main character is a Private I who comes to the aid of 6. 6 believes that 7 ate 9 and is now after him. Private I follows the trail of clues until he finds the real culprit whose nefarious motives are revealed in dramatic fashion. 7 Ate 9 is a versatile book. Young children will find it funny as they are introduced to the forms of the different numbers. Older children will be entertained by the double entendres such as “numbers…they are always stuck in a problem” and the many math terms sprinkled throughout the story. All kids will get caught up in figuring out whodunit. I confess, I read this book in Humphrey Bogart's voice. It's a creative adaptation of the old gumshoe classic films for children, which just adds another layer for adults to enjoy.